Speaking of critters and food, my amazingly talented shepherdgirl pal, Katherine Dunn at Apifera Farm, has done it again. I laughed, I cried, I realized how much (in my opinion) the world needs more people like her. What did she do exactly? She decided that her Goats For Peace could use some help with their worldwide campaign, and so "the farm animals have pumped up their efforts." Read this wonderful post on her Apifera farm blog, click here to see what she and her animals (including her new miniature donkey) are quietly doing for peace, check out what every hip foodie will soon be sporting here (because "goats eating with small lambs eating with big rams eating with donkeys eating with horses and cats and dogs and owls and birds...if all these creatures great and small get along, why not us?,") spread joy and love and peace half as eloquently as she does. Thank her. Thank you. Ummmmm .... not to denigrate a worthy ideal, but probably a larger percentage of the humans on Earth get along with each other than do all the other beasts? Our rabbits (pet rodents) think they like chocolate -- but then realize it's not as tasty as they thought. they do, however, go nuts for popcorn. Peace is joy everlasting. Joy is peace in motion. Count your blessings Farmgirl -- I know I have even with language issues at hand. If you make Donkeys for Peace and Chickenz <3 Peace buttons, I'd wear them!! And I am sure the chickenz would primp their feathers for a photo op. omg, if rodents ever got into my Valrhona stash I'd go ballistic. 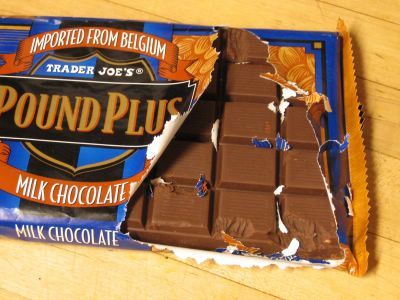 Get along with rodents who eat your chocolate? Not a chance in hell! I think the heat has gone to your head! Maybe they were just too full from all the paper they had just eaten! Returning from our holiday in Sweden and almost there catching up! Just let me get my breath. Now let me see: Lindy on the run, DDD turned into a bluecollar, and mice in your chocolate? Wow that is almost as bad as discovering last year that my christmas ornaments were ransacked by families of mice....NO, on second thought chocolate wins! Thanks for posting the link to Katherine's site! Now hers and yours are my daily "must-check" sites. And the pic of Patchy & Buddy Bear is so sweet!